The Head Graphene Instinct Lite tennis racquet is a lightweight yet strong and durable racquet. It is designed in a way so that it redistributes the weight of the racquet to the frame at the top and bottom. Though the unit is lightweight it is designed to provide more power than you would expect from its lightweight frame. The HEAD Graphene Instinct Lite tennis racquet has a head size of 107 square inches and has a length of approximately 27 inches. It has a weight of 9.9 ounces when it is not strung and weighs in 10.4 ounces when strung. Its balance when strung is 4 points head light approximately 33 centimeters. The swing weight of the racquet when strung is 310. Made with Graphene material the racquet is really nice to play with. It helps you to feel quick and light both on the baseline and by the net while provides exceptional power and it is designed with a large sweet spot as well. Along with all of that it maintains a solid feel while providing head light balance. Made from Graphene you know this racquet is extremely durable. Graphene is one of the strongest yet one of the lightest materials in the world at the same time. The breaking strength of Graphene is 200 times more than that of steel so you can just imagine how strong this racket is. The Graphene is integrated into the shaft of the racquet which helps to increase the strength of the racquet while allowing it to still remain lightweight. This material also allows for a redistribution of the weight to the ends of the racquet which in turn promotes power and maneuverability. Graphene also adds to the racquets capabilities to absorb shock so you get less in your shoulders, arms and elbows. The manufacture has added Kraibon which adds more shock absorption capabilities to the racquet without compromising the power that the racquet offers. The Head Graphene Instinct Lite tennis racquet is an ideal choice for beginners and intermediates who are looking for a racquet that will provide them with control over power while providing them with comfort at the same time. Made with Graphene XT you will like the way this racquet provides weight distribution and allows you to deliver a more powerful shot at the same time. 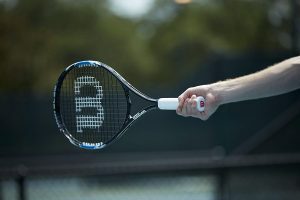 The racquet has a large head size allowing less experienced players to be able to play more confidently knowing that their margin of error is smaller thanks to the extended head size. The racquet offers easy depth on medium swings from the baseline while allowing for a fast swing and easy maneuverability. This allows the racquet to provide more spin along with more power from the baseline without you having to put in too much effort. At net the racquet offers a powerful hitting surface along with a quick touch to ensure that the racquet is a real weapon while being lightweight and comfortable. When you compare this racket with a number of others on the market you will find that it has the lowest frame flex which provides the additional comfort. It is a super light racket that can be likened to a junior’s racket so it really is great for beginners. When it comes to feel and touch the Instinct REV will feel better in your hand when compared to the Lite. When compared to others the Lite offers better play consistently from the rear of the court. With the Graphene and the large head you will find that this has a bigger sweet spot than the MP version while providing optimum control and power. It is stiffer when it comes to speed than the MP version but the MP version is built for no nonsense game play. When it comes to the net you will find that models like the MP offer better response. When compared to a lot of tournament level racquets and accomplished name brands they find that the frame is very maneuverable and not too rigid. Beginner and intermediate players will like what the HEAD Graphene Instinct Lite tennis racquet has to offer. If you are looking for a racquet that will be lightweight yet provide exceptional play at the baseline then this is a great option. It does provide a large sweet spot which is one of the features that make it such a great choice for beginners. A larger sweet spot allows you more surface area for play and practice and can help you to improve the efficacy of your swing while helping you to become more agile on your feet. We definitely recommend this Graphene Instinct Lite tennis racquet from Head. Just wanted to say keep up the good work! Hi, I do think this is an excellent web site. Please reply back as I’m looking to create my very own site and want to find out where you got this from or what the theme is named.